Oh, the possibilities! 3 sizes to decorate everything from flip flops, hair clippies, pony o's and more! For an authentic look, we've made ours from vinyl. 2, 3 and 4 inches. Made for the 4x4 AND 5x7 hoops. Please see detailed design information below. For an authentic look, we've made our baseball flowers from vinyl purchased at Joann Fabrics (see detailed image above for sku#). New to hair clippies? Find a free "How To Cover An Alligator Clippie With Ribbon" Tutorial by clicking on the Related Products tab. 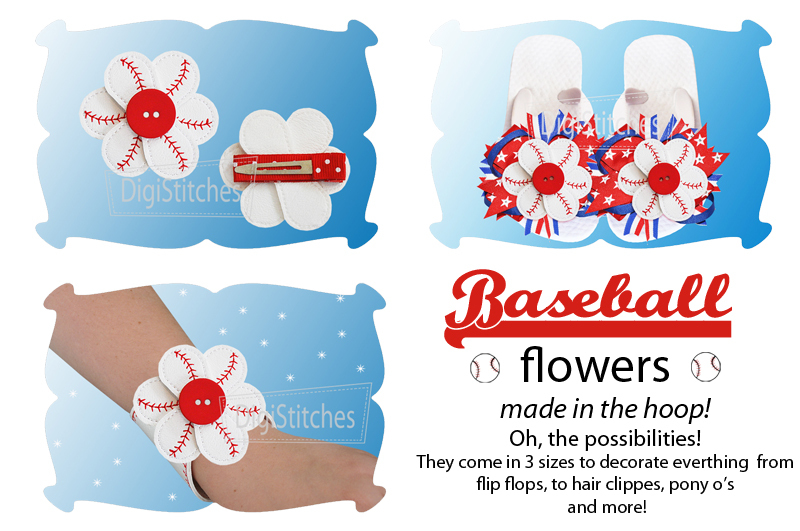 The baseball flowers come in 3 sizes: 2, 3 and 4 inches. The designs come in both Single and Multiple Files. The multiple files make 3 flower petals (one flower) at a time. The single files are made so you can copy and paste as many single petals as will fit in your hoop to make as many flowers as you need. 2 inch (made for the 4x4 hoop): Single: .69 inches x 2.00 inches. SC: 312. Multiple: 3.79 x 2.00 inches. SC: 948. 3 inch: (made for the 4x4 hoop): Single: 1.03 x 3.00 inches. SC: 452. Multiple: 3.90 x 3.00 inches. SC: 1361. 4 inch: (Single fits 4x4 hoop, Multiple fits 5x7 hoop): Single: 3.20 by 3.27 inches. SC: 594. Multiple: 4.98 by 4.00. SC: 1793.